Know a Pony That Jumps? USPC sends a team of the top three or four pony/rider combinations. Riders must be current members in good standing with USPC, have a minimum D-3 certification, and declare their intent to compete for USPC by March 15. Riders must also be members of USEF and ponies must be recorded with USEF at the time of declaring their intent to compete for Pony Club. In preparation for the competition we are starting on the “ROAD TO 2017 PONY FINALS” and we are calling all Pony Jumpers who want to come along for the “RIDE”. Any members interested in representing USPC at the 2017 Pony finals please contact Erin Woodall, activities@ponyclub.org, 859-559-0650 or Richard Lamb (Coach/Chef d’Equipe), Richard.b.lamb9@gmail.com, 828-817-1163. More information about the competition and the declaration are available here. 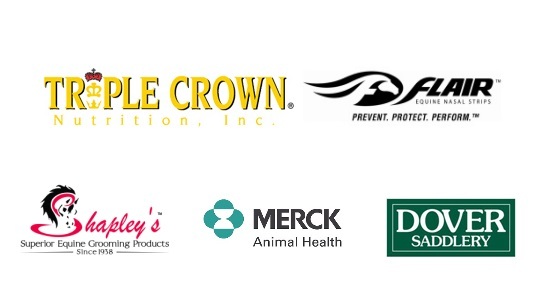 Once again, Equestrian Events Inc. has graciously offered 2 sets of four-day admission passes to the Rolex Kentucky Three-Day Event, for each of the USPC Regions. 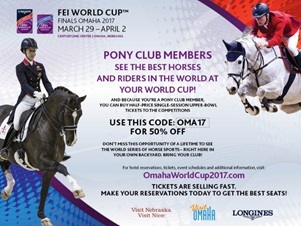 To take advantage of this offer, the RS of any interested regions should me, erin@ponyclub.org by March 15th, 2017. Note: these general admission tickets do not include grandstand seating for Dressage or Stadium, which can be purchased at www.rk3de.org. As this is a lovely benefit to our Pony Club Members, we will be requesting that each person who receives tickets send a personal thank you note to EEI for their generosity to Pony Club. Specific instructions on how and where to send thank you notes will be included when the tickets are mailed. The new adoption and sales page provides users with easy access to learn how and where to adopt a wild horse or burro, or how to purchase an animal. If you don't see a a location near you, be sure and contact us at 866-468-7826 to learn more. Submit your artwork for the Festival Features Cover Contest today. Festival Features is the USPC Festival Souvenir Program given to all attendees during the week-long celebration of Championships and Education in July at the Kentucky Horse Park. Hardcopy and electronic entries accepted. Contest entry deadline is May 1, 2017. Entries can be emailed to Marketing@ponyclub.org or mailed to Art Contest at USPC, 4041 Iron Works Parkway, Lexington, KY 40511. The winning entry will not only appear on the cover of Festival Features, the submitter will also win a $200.00 gift certificate from www.shopponyclub.org. The Live Oak Hounds Challenge is a way to encourage clubs and their members to become involved in the sport of Foxhunting. Clubs who get the most members who have not hunted before — or have hunted on a limited basis — to participate in three or more hunts during the season are awarded cash prizes. Click here to access full details on the challenge. The award period will run June 1 through April 9, and the winners will be announced in May. Certificates must be postmarked by April 10. Necessary for all rallies beyond February 1, 2017. Please make sure to update your libraries. The 2017 Horse Management Newsletter will be out later this month. Dressage4kids, Inc. is very proud to offer the Dressage4Kids’ TEAM Program for dedicated, determined young dressage riders of all ages and all levels. The goal of the program is to find, to help to educate, and to be part of the development of talented youth to become the international riders, teachers, and trainers of the future. This opportunity is open to Pony Club youth members and non PC youth members who want to participate in this unique program during Festival Education, July 23 and 24th, 2017. Information regarding the D4K TEAM Program can be found here. And the application form here. Once registered (limit is 10) then contact Connie Jehlik, Instruction Director, instruction@ponyclub.org at the USPC National Office for further information and additional fees associated with this opportunity. The following Instruction topics are planned for Festival 2017: H-A Prep, H-B Prep Workshops, Masters Clinic with Lendon Grey, Trailering Safety, Basic Balanced Position using a balance barrel, How to Complete a Record Book, Driving and how to get started, Acupuncture/Pre-Purchase, Rider Saddle Fit, Conditioning for Competition, Toxic Plants, Digestion and Anatomy, Vaulting, D level Nutrition and Bandaging Basics, Farrier tools and Shoes, World Class Grooming workshops given by Cat Hill, Bits, Horse Management D and C Level and more! MOUNTED Instruction will be two days only, July 23rd and 24th. The disciplines available to choose from are: Cross Country, Dressage, Show Jumping, Games, Polocrosse, Distance Riding, and Horsemanship/Ground Training, and Western Dressage. D Camp during Festival Education: This camp is designed for the Pony Club youth member up to the D-2 Level. They will ride twice a day and get to experience small group instruction. Besides riding they will have unmounted instruction in the barn and a chance to experience taking care of their pony while at the Kentucky Horse Park. There will be limited number of slots for D Camp so make sure to register early. Registration will be online only and tentatively set for May, 2017. Plan to come and learn and be part of Festival Education as a Pony Club family, July 22-24, 2017. Pilot for a Dressage Testing Center, allowing the opportunity to test to a C-3, B, or A level Dressage Certification using a borrowed horse. Scheduled for Labor Day Weekend - September 1-4, 2017, in Bauxite, Arkansas. Are you interested in pursuing the Dressage National Level Certification (C-3, B, A) but lacking a suitable horse? Or perhaps are too far in distance from a regularly scheduled certification, or lacking transport, or have a horse who is a difficult traveler? Are you a college student riding on an Intercollegiate Dressage Association team but lacking a horse during the summer testing season? Then this test is for you! Learn More.